Ships from and sold by Tyke Supply. Sold by Wali Electric and ships from Amazon Fulfillment. 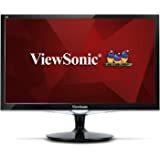 QEONIX PREMIUM 2-way privacy screen provides a 45° field of view directly in front of your screen to effectively block the view of those beside you while striking the perfect balance between blacked out privacy viewing and daytime clarity. Protect your privacy when you need such as in an airplane, on a city street or visiting a local coffeehouse and finally focus on your work. WHY CHOOSE OUR PRIVACY FILTER? QEONIX 9H Screen Protector blocks views more effective than other brands of protectors on the market. It also offers HD clarity when viewing directly in front of the screen. Other privacy screen protector brands may cause the screen to be too dark when viewing it from a straight-on position. The screen will become invisible when the view angle exceeds 45 degrees. 9H Real Tempered Glass protects your phone perfectly from scratches, even with a knife. 3 times stronger than regular PET film protectors. Ultra-slim 0.3mm thickness ensures a smooth-to-the-touch feel. This screen protector makes your touchscreen sensitivity much higher. Prevents excessive fingerprinting and oil stains, and makes the surface easy to clean. ※Please note: 1. Designed exclusively for iPhone XS Max. 2. Privacy protection works when the phone is in a vertical orientation (portrait mode) only. 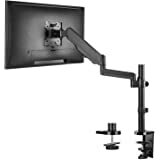 5.0 out of 5 starsA great value in a dual-arm monitor mount! I knew I was going to like this monitor mount as soon as I opened the box. The mount was triple packed, including a double-wall outer box with straps, a single-wall inner box, and individual boxes for the primary components. Better still, there was very little non-recyclable content in the packing materials ... mostly corrugated with a few plastic bags. The mount is made in China, and some of the manufacturing tolerances are sorta loose (e.g., the two clamping screws either not exactly in the same place or are not parallel with each other, because they do not have the same amount of clearance with the back of my desk), but the unit is made of very heavy materials (and the finish is decent) so I have no concern about this thing holding up with my two LCDs (a 23" Asus and a 24" Dell) on it. The design of the unit is simple, but they included several good touches: e.g., screws and spacers for the back of the monitor, extra caps for the knuckles, wire guides, etc. 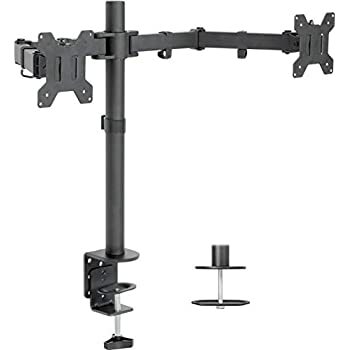 Each arm has three knuckles that pivot horizontally (which provides a ton of flexibility for monitor positioning) and one that pivots vertically (monitor tilt), and the mounting plate can also rotate to keep your monitor level. 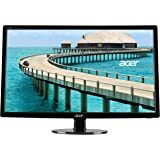 Because my monitors are not the same size, I wish I could set the heights individually, but at this price point that's probably asking for a bit much. Like some others who have looked at this mount, I have a rather small lip on my desk ... only a little over an inch ... but I liked what I saw in the reviews for this product, so I took and chance that I would be able to come up with a way to mount it without cutting a big hole in the back wall of the desk. The photo shows my solution. Having woodworking as a hobby helps, because I have a bunch of oak scraps lying around, so I made a piece to fit under the base of the mount, and I ran one 2" coarse thread drywall screw through it down into the top of the desk. 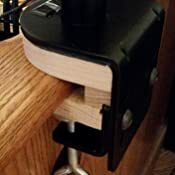 I made another block to go under the lip of the desk to give the clamping bolts something to bite on. In between, I placed a small piece (the same thickness as the desktop) to keep the other two pieces parallel and provide a fulcrum around which the bottom piece can rotate a little when it clamps onto the desk. As nearly as I can tell, this is going to work just fine (I'm using it as I write this), so I will take it all apart and stain the pieces to match the desk before reassembling it for good. - I had to snug up the tilt knuckle screws behind both monitors quite a bit to get them to stay put after attaching the monitors. - The clamping bolt assembly was incorrectly assembled (the bolts were inserted in the wrong direction). Fortunately, it was very easy to take it all apart and reassemble correctly. 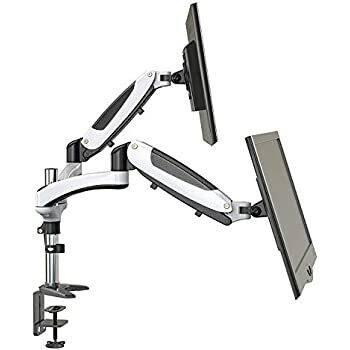 Bottom line: for less than $50, this is a great dual monitor mount! 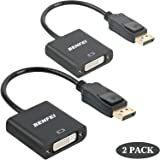 5.0 out of 5 starsInexpensive and easy to install. No frills like swiveling through! 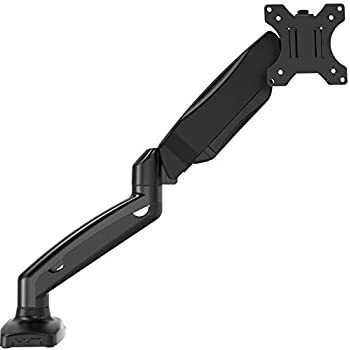 Purchased these monitor arms because of the positive reviews and the friendly price. So far, I am very satisfied with the purchase. -Setting up and things I liked. There were a breeze to setup and almost easier than more expensive options. 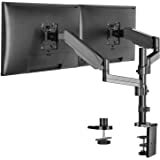 I was a little hesitant because other monitor arms usually have a removable bracket that attaches to the arm itself. 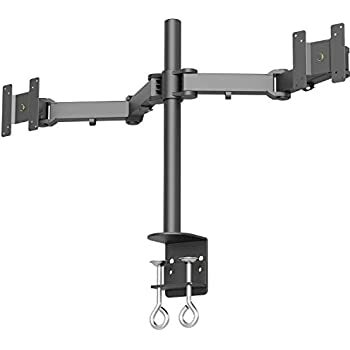 These require the monitor to be bolted on to the arm, which makes for a little more challenging installation given you have to hold the monitor while you screw it in. Thankfully, the screws have plastic knobs which allow you to install without a screwdriver. I also enjoyed how the cable clips are installed. It makes for almost invisible cable management. -Things I do not like. This is about as no frills as you can get and won't be suitable for someone who has frequent orientation changing needs. 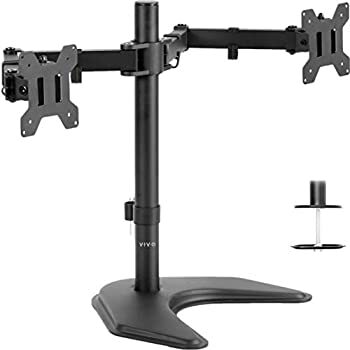 The monitor arms require hardware if you want to move them along an X-axis (up and down). I bought these a while ago, sometime in 2014 but not sure exactly. I bought 8 of these, one set for each cubicle in our engineering department and set them up all identically to the way I have them in the picture attached. They work very very well at freeing up a little more desk space when you have multiple monitors. 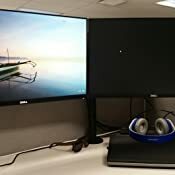 The allows you to remove the typical desktop monitor stand and allows you to slide your stuff under the monitors that you would normally not be able to. 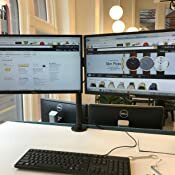 We have changed monitors since the initial purchase, but I was able to fit two Dell 27" monitors on these stands, and now I am using 24" (in the picture). 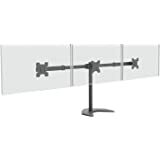 The only difference is the amount of angle you get, with the large 27" monitors the tow monitors form almost a 180deg angle so you would need to put them on a relatively flat space. The smaller the monitor the more of an angle you can put on them and you get a nice corner monitor setup at the 22" and below monitors. 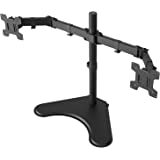 Very heavy duty and quality product, easily put together and very easy to hook to our desks. Recommended for people looking to free up a small desk space. This is an exceptionally good product for the price. I almost wish I needed another one! I've used a variety of mounts over the years, and this one is a good blend of easy installation, lightweight structure, and structural soundness. I have a narrow older but well-made computer desk that tends to wobble a bit. 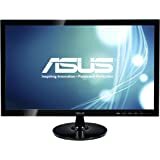 The monitors' built-in stands were not very sound and resulted in shaky monitors that I always felt would topple. This stand is super impressive. Even with a bit of desk wobble they don't move at all. I can reposition them easily, and the mount allows you just about any mounting combination you can imagine, except varying heights (unless I'm missing something). 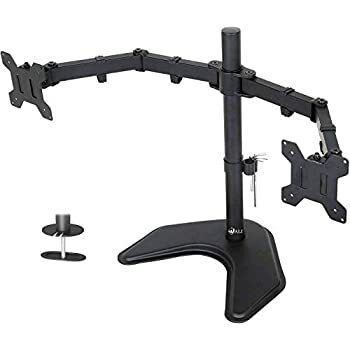 The arms of the mount allow tension adjustment from being impossible to move all the way to extreme flexibility, so you can choose for yourself. Mine are tensioned tight and no amount of bumping the monitors is moving their position. It's pretty classy looking too, with nice plastic covers for all the joints. Very impressed, would definitely buy again. It's still pretty new so I will update if any long-term issues arise, but I do not expect any.